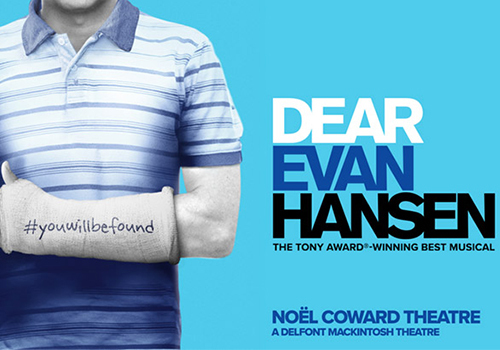 Tony Award-winning musical DEAR EVAN HANSEN has been charming Broadway since 2016, and finally arrives at the West End’s Noël Coward Theatre in November 2019. The show premiered at the Arena Stage in Washington D.C. in 2015 before enjoying an Off-Broadway production and then a run at the Music Box Theatre on Broadway. It fared very well indeed at the 71st Tony Awards, when it received nine nominations and won six. Among its victories were Best Musical, Best Score, Best Actor in a Musical for Ben Platt as Evan, and Best Featured Actress in a Musical for Rachel Bay Jones as Heidi. Direction comes from Michael Greif, a thrice Obie Award-winner whose credits include Rent and War Paint on Broadway. The musical is produced by Stacey Mindich, who has stated her intention to find a British company for the London production. Composers Benj Pasek and Justin Paul wrote the score, of which The New York Times’ Charles Isherwood noted: "the songs (...) strike the same complex notes, with shapely, heartfelt lyrics". Set design is courtesy of David Korins, costumes are by Emily Rebholz, lighting comes from Japhy Weideman and sound design is by Nevin Steinberg. Casting for DEAR EVAN HANSEN is yet to be announced. DEAR EVAN HANSEN begins performances on October 29th 2019, with an official opening night on November 19th. Find out what all the fuss is about as this huge hit of a musical rolls into the West End. DEAR EVAN HANSEN is suitable for those aged 12 and above.